In our previous discussion we came across the basic Spring MVC features, we created a simple Hello World application using Spring MVC in eclipse, than we came to know how to integrate Spring with Hibernate. We have also implemented Tiles with Spring MVC. In this particular blog we will be concentrating on Basic spring form tags and their implementation. Before we dive into spring form tags and their usage, lets take a look at overall project structure for today's discussion. Following are the maven dependencies that we have to add to make it a spring web mvc project. We all knows it already that every web application starts with a web.xml file in java. Here we have added a servlet entry with name DispatcherServlet this will tell the container that every request that ends up with '.html' will be handled by spring itself. This is the welcome file for our example project, we have added a send redirect here so that the application control can be transfered to spring. This file is the core of spring MVC projects, all related configurations and setting goes here. 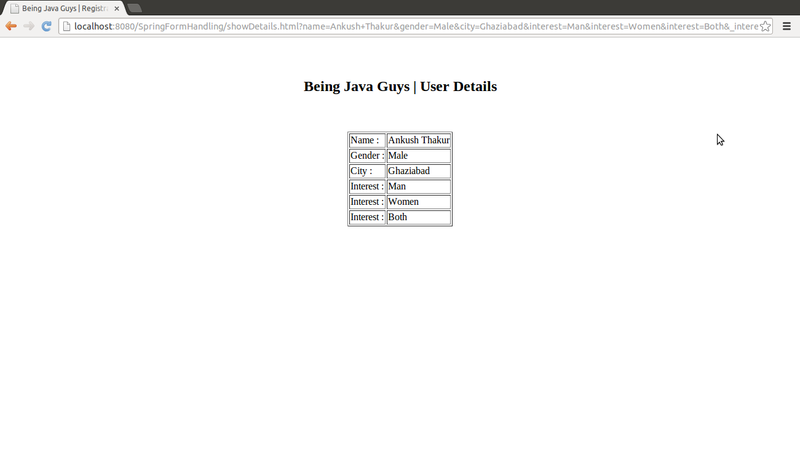 This is a simple java file that indicated the details and attributes of User, we have to add user's details through spring form tags and w'll associate those values to User bean. Ths is the controller for our application, here we have added two request mappings according to our project need. 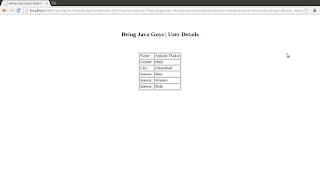 "/getSpringForm" is responsible to render a jsp page with form elements to add up details there. When user clicks on submit button the control is transfered to '/showDetails' mapping to show entered details in correct format. 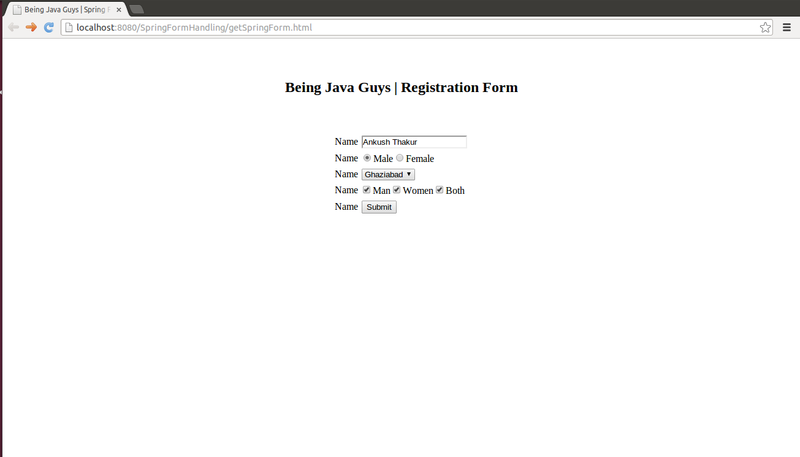 This is the actual jsp file which contains all spring tags so that the registration form with mentioned fields can be rendered against the user. This is the jsp file which cotains code to show up all user details and values that are being added to spring form at the time of registration. Here we are done with all configurations and coding, just run the application on server and you will get a registration spring form something like this screen. Once all fields values are filled and the user clicks on submit button, all those details are handled over the request url and submitted values can be seen as shown in next figure. Today we have created a spring form tags simple hello wold application in eclipse. In our next tutorials we will come to know more about spring and other java web frameworks and technologies. Download project source code from GitHub.